Could Alzheimer's Be An Infectious Disease? : Shots - Health News Money has poured into Alzheimer's research, but until very recently not much of it went toward investigating infection in causing dementia. A million dollar prize may lead more scientists to try. But this "germ theory" of Alzheimer's, as Norins calls it, has been fermenting in the literature for decades. Even early 20th century Czech physician Oskar Fischer — who, along with his German contemporary Dr. Alois Alzheimer, was integral in first describing the condition — noted a possible connection between the newly identified dementia and tuberculosis. 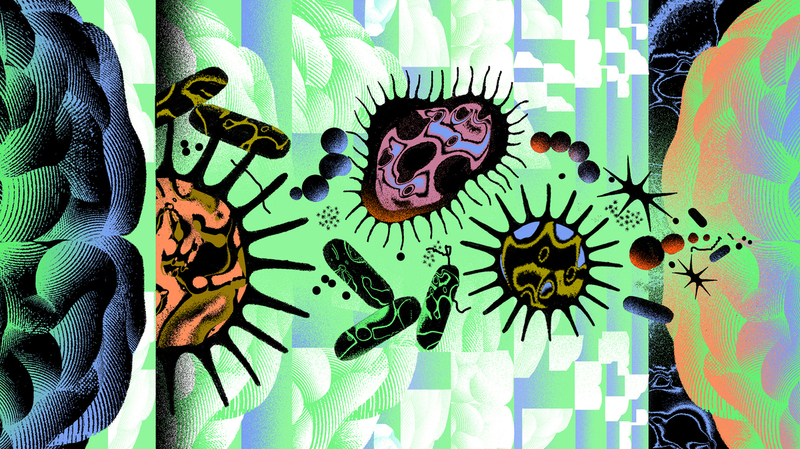 If the germ theory gets traction, even in some Alzheimer's patients, it could trigger a seismic shift in how doctors understand and treat the disease. In 2017, Norins launched Alzheimer's Germ Quest Inc., a public benefit corporation he hopes will drive interest into the germ theory of Alzheimer's, and through which his prize will be distributed. A white paper he penned for the site reads: "From a two-year review of the scientific literature, I believe it's now clear that just one germ — identity not yet specified, and possibly not yet discovered — causes most AD. I'm calling it the 'Alzheimer's Germ.' "
Norins is quick to cite sources and studies supporting his claim, among them a 2010 study published in the Journal of Neurosurgery showing that neurosurgeons die from Alzheimer's at a nearly 2 1/2 times higher rate than the general population. NPR reported on an intriguing study published in Neuron in June that suggested that viral infection can influence the progression of Alzheimer's. Led by Mount Sinai genetics professor Joel Dudley, the work was intended to compare the genomes of healthy brain tissue with that affected by dementia. But having the herpes viruses alone doesn't mean inevitable brain decline. After all, up to 75 percent of us may harbor HHV-6 . Tanzi believes that in many cases of Alzheimer's, microbes are probably the initial seed that sets off a toxic tumble of molecular dominoes. Early in the disease amyloid protein builds up to fight infection, yet too much of the protein begins to impair function of neurons in the brain. The excess amyloid then causes another protein, called tau, to form tangles, which further harm brain cells. But as Tanzi explains, the ultimate neurological insult in Alzheimer's is the body's reaction to this neurotoxic mess. All the excess protein revs up the immune system, causing inflammation — and it's this inflammation that does the most damage to the Alzheimer's-afflicted brain. Dr. James Burke, professor of medicine and psychiatry at Duke University's Alzheimer's Disease Research Center, isn't willing to abandon the amyloid theory altogether, but agrees it's time for the field to move on. "There may be many roads to developing Alzheimer's disease and it would be shortsighted to focus just on amyloid and tau," he says. "A million-dollar prize is attention- getting, but the reward for identifying a treatable target to delay or prevent Alzheimer's disease is invaluable." The initial version of this article overstated the rate at which neurosurgeons and spouses of Alzheimer's patients develop the dementia. The risk is nearly 2 1/2 times greater for neurosurgeons, not sevenfold, and 1.6 times higher for spouses, not six times greater. On Sept. 18, the article was changed to say that the risk for neurosurgeons was a comparison with the general population, not other causes of death for the doctors.